What parent doesn’t worry about his/her child’s future? I’m the mother of three, and I worry about each of my children. Their happiness, their successes, their abilities to carry on and be independent. Yet the issue becomes a bit more comprehensive when a child has a disability. My youngest son, David, was diagnosed with autism spectrum disorder (ASD) just before his second birthday. He turned 25 this year, and I found myself wondering, as I surmise most parents do, if I have made all the right choices. One of the most weighted decisions I faced as a parent was what David would be doing after graduating high school. There would no longer be a set routine of racing to meet the morning bus, regurgitating school day events, and evaluating whether or not he was being productive on someone else’s watch. Now it was up to me, the mom. When asked what job he wanted to pursue, David clearly stated that he wanted to be a “cartoonist,” as he branded his approach to his art. OK, that was simple enough. Yet ruminating how I would help him accomplish this forced me to face my own fears. Was I up for this challenge? Could I help him cultivate his art to the level he needed to be successful? Was this something David could actually make a living at? Would this just be organized playtime? How could I shape this into a program that would be endorsed by the state and not deemed a complete waste of time? In consideration of the challenge, I realized I’d have various factors to take into account. I would have to develop a program based on something creative enough to indulge his inner artist, while being constructive to further develop his communication skills. The activities chosen would have to be appealing, yet concise, so he would willingly participate whilst completing guided assignments. Altogether, it would have to prove productive to ultimately produce a marketable product that could potentially provide a source of income. Utilizing state resources, I created a self-directed program that would not only allow David to pursue his artistic dream, but do all these things. During his time at school, I had stumbled on an idea to reverse engineer his communication. By having David depict things he learned about or activities he had participated in, he could tell me by drawing what he had done that day. It was as if he drew his own cheat sheet. He would use the drawings to then verbalize what he did that day. I further developed this concept by having David depict his activities and comparing them with actual photographs of the situations he had participated in. We compared the live images to his illustrations of his characters, The PuppyDucks™, participating in similar situations that David had engaged in. Not only did this provide a forum for David to pursue his artwork, but it helped increase his vocabulary. We were able to use his cartoons to create social stories to help him better understand difficult situations he had encountered. When I chose to take this on, I looked at David’s program as if I were developing a business plan. How did I see the first five years going? What would we be doing the first year, the second, the long way down the road year five and beyond? Determine a schedule that would suit David and our family’s needs. Hire the right people to work with him. Determine what he would be working on: it wasn’t just about art, but giving him experiences to have something to draw about. Develop his talent as an artist; this would require hiring at least one person who was an artist. Find and access available community resources. Determine whether he could develop friendships and offer something in return. Determine whether he could be given tasks and complete and meet deadlines if he were handed professional assignments. What resources did we have available to get started? What was David interested in working on? Could we make this project marketable? In the first year, David landed a job as the comic-strip artist for a local health food store’s newsletter. It fit all aspects of the first year’s plan. Not only was David able to get involved with his community through this local business, but he met his responsibilities keeping deadlines for the monthly comic-strip. He completed a year’s work as he learned about healthy eating topics, and portrayed the subject matter given to him as only he could interpret. Year two was actually quite amazing. We chose to publish a book as David’s first marketable project. The book had been created by his para-professional during his school years to help him through different situations. With my past experience in publishing, I knew the book needed to be expanded and David would have to redraw the illustrations. He would also have to expand his work to include programs like Photoshop to raise its quality in order to publish. I released an eBook version to test the market. It successfully debuted at an autism event resource fair, and proved a great success with over 200 downloads the first week. David’s first illustrated book, Look At Me Look At Me: An Eye Contact Game For You and Me, is now available in print at online bookstores along with the original simpler eBook version. Despite our third year getting off to a rough start, I’m proud to say that we’ve been able to hit most of the targets I had set forth to accomplish. David was hired to create an illustration for a book that was published earlier this year, and he continues to make various strides in communication and other areas. Often health or family issues might intervene, but never get discouraged. Keep a clear eye on your objectives and keep your child engaged and focused. With perseverance, your project agendas will come together. Plan a schedule: how will your child adapt? How will the program work with your family life? Where will the child work? Is there room in your home? Do you feel comfortable with the people you hire taking your child out? The first year, we did a lot of work at our dining room table while David acclimated to his new routine. As time passed, he became able to go out with the people who work with him. They take him places and do things that I can’t as I have my own physical limitations being diagnosed with multiple sclerosis (MS). I’m not able to take him hiking or running, and Dave enjoys both, easily managing five miles a day. I’m forever grateful to each of them. What does your child enjoy doing? This is an opportunity to discover new points of interest. Maybe he/she enjoys singing; thus, how can you encourage a career in music? What about learning and using a computer? David taught himself how to use every program on our computer. Early on, he found PowerPoint and taught himself how to use it to create animation for his own self-entertainment. What if you put a camera in your child’s hands—what would he/she see? What would your child capture? Could he/she tell a story in pictures that may not make sense to you? If allowed to unravel, it could provide amazing insight. Are there established organizations that your child could attend? There are therapeutic programs as well as enjoyable activities like horseback riding, art therapy, music lessons, and tutoring programs. The program has undergone numerous changes, as I’m sure it always will. As Dave’s interests change, we’ll continue to add new things for him to work on and ways for him to express himself. Ruth Cruz is a parent advocate as well as the director of an imaginative and structured self-directed program she devised for her son to enable his post-education employment. 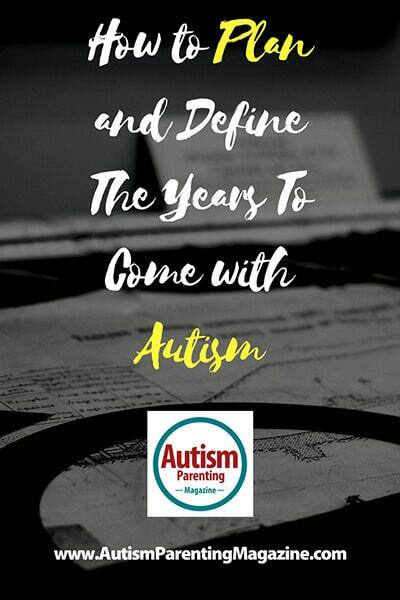 Ruth’s original experience with autism began when she developed a home-based early intervention program after her son was diagnosed just before turning two. Ruth’s professional path took her through various creative arenas including being a producer in film/video, radio, and then finally publishing. Reprising her role as program director, Ruth relied upon these experiences to foster her son’s choice to be an artist and published his first book as an illustrator. Her fulltime career options were stunted when she was diagnosed with multiple sclerosis. However, she continues to work as an editor on assorted publications including books about sound-based therapies and how they can be used to help people with autism and other disabilities. Ruth embraces her role as an advocate and avidly engages in defending those who may not have the resources or abilities to challenge unjust authority. Most recently, she has been engaged in the fight to secure Medicaid rights that are in jeopardy with the proposed health care law changes in the US. You can reach Ruth via the messenger app online through the PuppyDucks™ Facebook page.